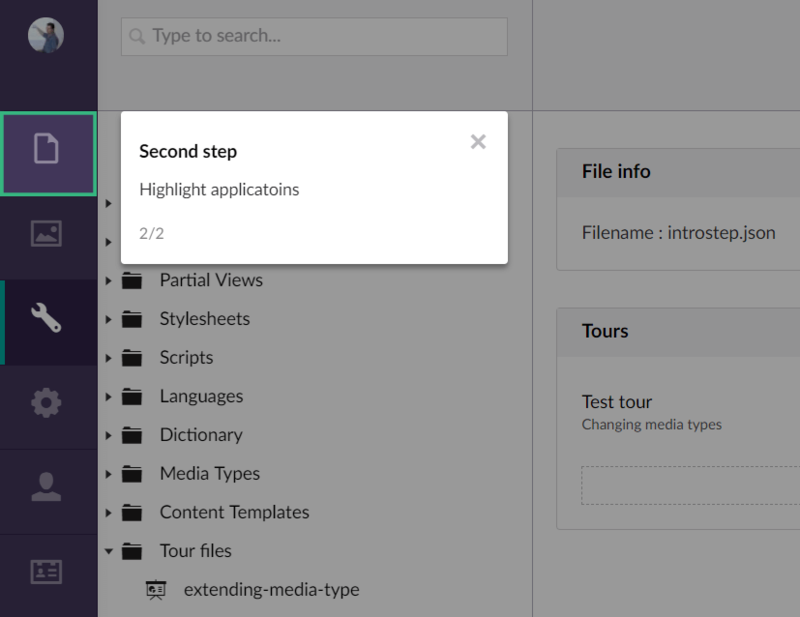 Backoffice tours are managed in a JSON format and stored in files on disk. The filenames should end with the .json extension. The tour functionality will load information from multiple locations. 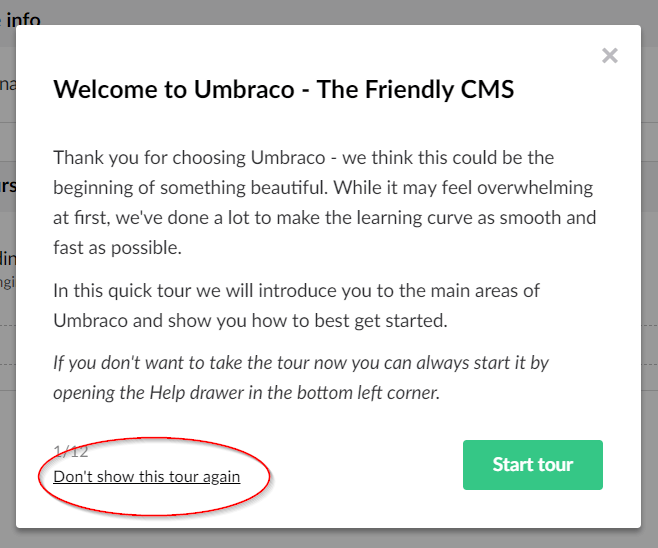 The tour files that ship with Umbraco are stored in /Config/BackofficeTours. This is also the recommended location for storing your own tour files. 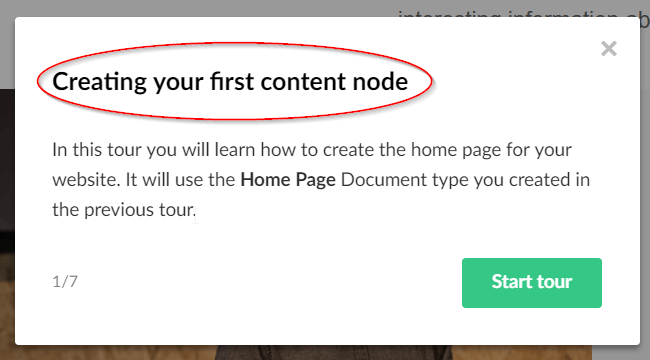 If you want to include a tour with your custom plugin you can store the tour file in /App_Plugins/<YourPlugin>/backoffice/tours. 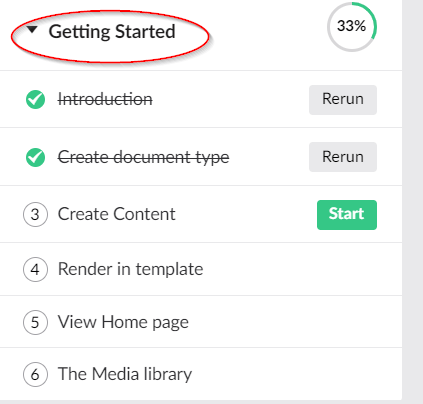 It is recommended that you place the tour files in this location when you are creating a plugin. A tour file contains an array of tour configuration JSON objects. So it's possible to have multiple, (un)related tours in one file. A tour configuration JSON object contains all the data related to a tour. This is the name that is displayed in the help drawer for the tour. The unique alias of your tour, this is used to track the progress a user has made while taking a tour. 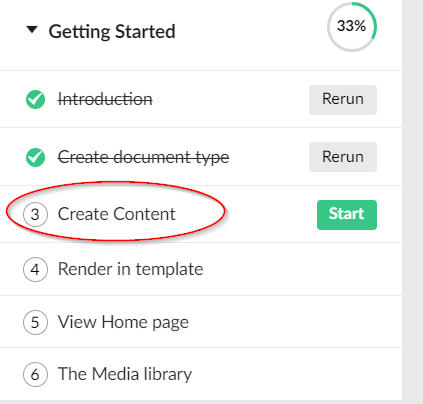 The progress information is stored in the TourData column of the UmbracoUsers table in the database. The group property is used to group related tours in the help drawer under a common subject (e.g. Getting started). This is used to control the order of the groups in the help drawer. This must be an integer value. A boolean value that indicates if the "Don't show this tour again" should be shown on the tour steps. If the user clicks this link the tour will no longer be shown in the help drawer. You can set a culture (e.g. nl-NL) and this tour will only be shown to users that have set this culture in their profile. If omitted or left empty the tour will be shown to all users. This is an array of section aliases that a user needs to be able to access. If the user does not have access to all the sections the tour will not be shown in the help drawer. e.g. 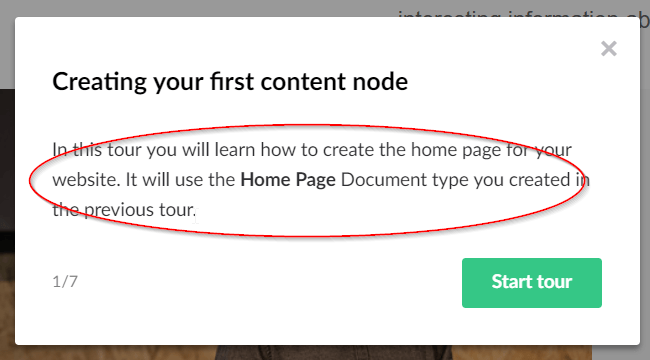 if a tour requires content, media and settings and the logged in user only has access to content and media, the tour will not be shown for this user. This is an array of tour step JSON objects that a user needs to take to complete the tour. A tour step JSON object contains all the data related to a tour step. This the title shown on the tour step. A CSS selector for the element you wish to highlight. The tour step will position itself near the element. 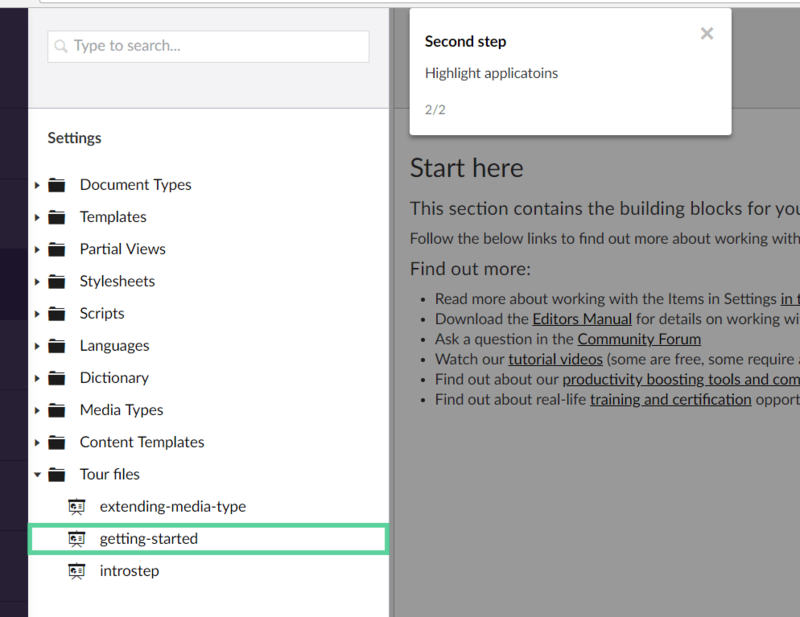 A lot of elements in the Umbraco backoffice have a "data-element" attribute. It's recommended to use that, because "id" and "class" are subject to changes. e.g. TIP: Use the developer tools from your browser to find the id, class and data-attribute. As an example, it is very useful when you would like to highlight a button, but would like to prevent the user clicking it. If not set or omitted a "Next" button will be added to the tour. The image below shows the entire tree highlighted, but requires the user to click on a specific tree element. A decimal value between 0 and 1 to indicate the transparency of the background overlay. This is useful if you would like to validate input from the user during the tour step.